I thought this is a Photo I must upload and add to a Blogpost. I found that Photo somewhat abstract. I took this Photo when I opened my Fish Tank. This is a Plant, to be exact this is a Moss called Riccia fluitans and it is floating on the Water Surface. Some time ago I did place this Moss on stones with a Hairnet. Many people do it. The thing is it will grow and after some time you wont see the Hairnet anymore and the Stone will keep this Moss underwater and it looks like crazy green Moss Bundle Hills then. Sad that I dont have a Photo of it from the past. Really it looks pretty awesome then if its underwater instead of swimming on the Water Surface but believe me it is a hell of work to hold it underwater as Riccia fluitans wants to swimm on the Water Surface. Simply because it grows fast. 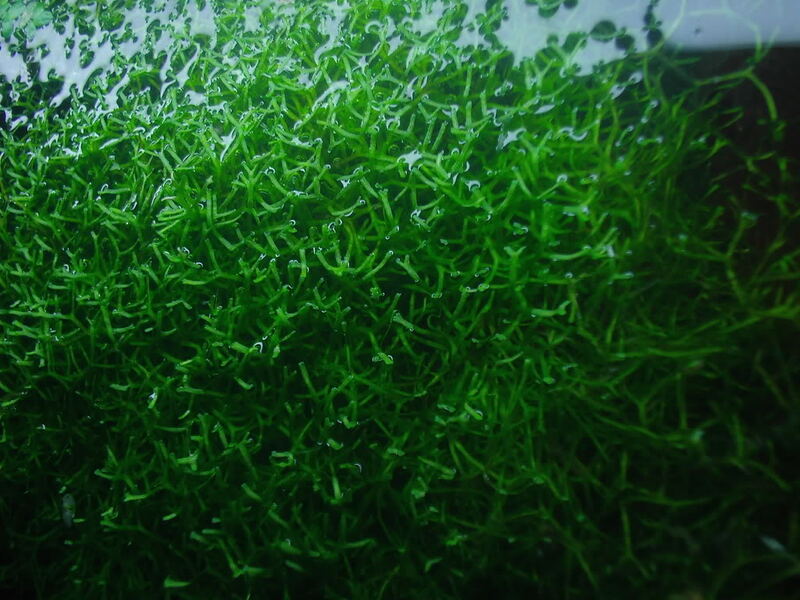 So fast that the bottom Moss wont get light anymore and then the bottom Moss will die because of that and the healthy end which got Light will float through your Fish Tank and later float anywhere on the Water Surface and grow there. This is how Riccia fluitans want to be and the only way to keep it on these mentioned Stones is if you regularly cut the Riccia fluitans so that every Part of the Plant gets Light. So back in the days I did give up to hold Riccia underwater. It is to much work and I dont want to go to often with my Hands and the Scissors into the Fish Tank as this would also disturb the Fish. I am rather the opinion that this is a biotope I wont disturb every week. And my Experience is that this is a good Decision for the wellbeing of the Fish. So what you see above on the Photo is this kind of Moss but floating on the Water Surface. And I just thought this Photo looks abstract so that I wanted to share it.